The Lancia Integrale and Mitsubishi Evo both dominated the World Rally Championship at different ends of the Nineties. The Lancia took three Manufacturers’ titles between 1990 and ‘92, while Juha Kankunen won the Drivers’ crown in ‘91. Various versions of the Mitsubishi powered Tommi Makinen to four consecutive Drivers’ titles from ‘96 to ‘99, with a Makes’ award in ‘98. Both are now bona-fide modern classics. Here’s an exceptional example of each, both at 4Star Classics. You probably don’t need me to tell you how the Lancia Delta Integrale came to be, but here’s a re-cap just in case. When the FIA banned the monstrous Group B cars from the World Rally Championship at the end of the 1986 season, most manufacturers were caught on the back foot for the upcoming Group A rules. The new regulations stipulated a 2-litre, turbocharged engine and four-wheel-drive. Lancia already had such a car in development - the HF 4WD. It was a bit crude and had some pretty fundamental limitations - they couldn’t fit big brakes, for one. But continuous development (the Integrale was introduced in 1988) and a lack of serious rivals meant Lancia achieved an as-yet unbeaten run of six Manufacturers’ championships from 1987 to 1992. By the start of the Nineties though, Lancia was facing increasingly stiff competition from Toyota with the much more up-to-date Celica GT-Four. Lancia’s fightback came in the form of the Integrale Evolution, with its huge, boxy wheelarches, increased power and more advanced technology. The great thing about the Group A rules was that manufacturers had to produce a closely-related road-going version of the rally car. All the Integrale road cars had been fantastic, but the Evolution was arguably one of the greatest driver’s cars of the Nineties. With its four-square stance and sub-four meter length, the Evo had incredibly keen, agile handling. And although 210bhp doesn’t sound much now, it was more than enough leave supercars for dead on a twisting country road. 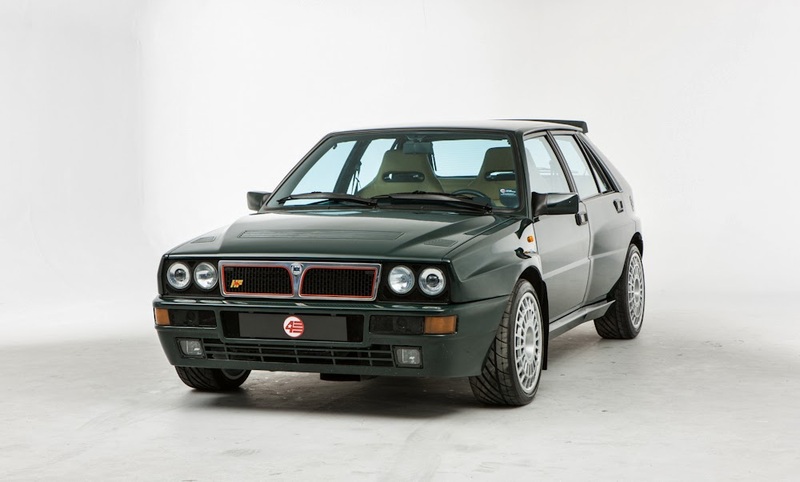 4Star Classics’ Integrale is one of 200 Verde York edition cars built. I generally prefer Italian cars in dark colours and this shade of York green (geddit?) is just stunning. As are the gigantic, beige leather bucket seats (we’ll ignore the properly crap dashboard). And let’s not forget those iconic, 17-inch Compomotive wheels. It’s got a fair few miles, but the history looks cast-iron. 23 grand seems fair money for a hugely desirable car. Mitsubishi had been active in rallying since the Seventies. Its cars were never really in contention for WRC wins, but had success in Africa, including a single WRC-level Safari Rally victory. The Eighties brought an unsuccessful attempt at Group B with the Starion, but things started to get serious with Group A and the Galant VR-4. The Galant was too big and heavy to be a serious threat, but it still picked up a handful of victories. By ‘93 Mitsubishi needed a new car and the smaller, lighter, more advanced Lancer Evolution was it. 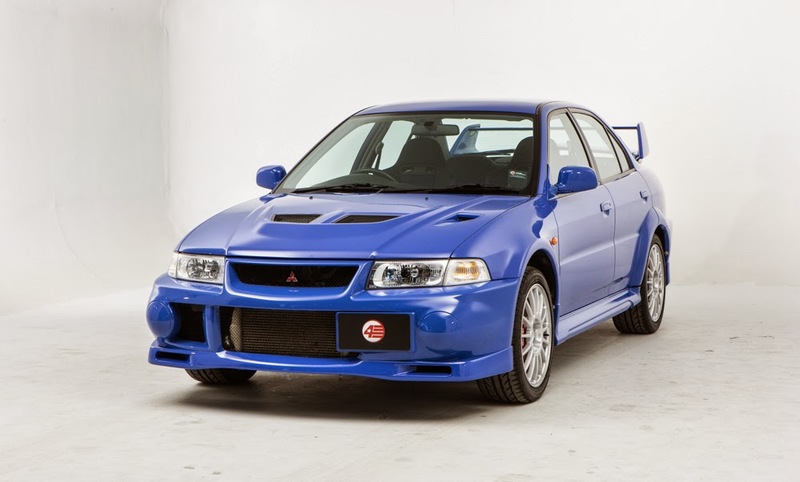 By ‘96 it became a championship-winner in its third generation and the Evo 4, 5 and 6 followed suit. Incidentally, it’s worth pointing out that from ‘97 the production-based, Group A Evos beat the new prototype-formula WRC-spec cars. As ever with Group A cars, a road-going version of the rally car had to be produced. And as with the Integrale Evo, the Lancer Evos were some of the greatest driver’s cars ever. Of the ten generations that have been produced however, the Evo 6 is widely regarded as the best. It’s easy to see why. With its active centre diff and active yaw control, the Evo 6 had simply staggering levels of grip. And fantastic handling to go with it. Power was officially given as 276bhp as per Japanese rules, but it was probably more - a 0-60mph time of just 4.4 seconds testifies to that. Even more impressive was the 0-100mph time of 11.2 seconds. But if anything the brakes were even better - it could do 0-100-0 in little more than 15 seconds. Fortunately the forces it produced were just about strong enough to make you forget the ugliness of the exterior and the nastiness of the interior. Earlier Evos weren’t as sophisticated, and later ones became a bit bloated and over-complicated. And the 6 was the first to be officially imported to the UK, which will always lend it a certain cachet. The example at 4Star Classics is an original UK-supplied car, of which there are relatively few. Even rarer is the rather lovely Reims Blue colour. 15 grand is a lot for an Evo 6, until you realise that this one has just 20,000 miles. Which means it’s still brand new. So that’s £15k for a brand new car that can probably embarrass even recent Ferraris on a Welsh mountain road. That’s the bargain of the century, surely. Check out Graham's Facebook page, Headboltz, here.